South Seminole Hospital and the J. Douglas Williams YMCA celebrated Red February with a fun filled day promoting heart health. Family, friends and neighbors joined for a family-friendly 5K event, followed by a free health expo with physician and vendor displays in the YMCA. 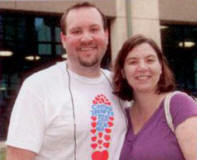 Multicom’s Manager of Marketing & Technology, Matt Conrad and his wife Iva Conrad, participated in the event. Since then: Matt and Iva are now proud parents of a bouncing baby boy. Welcome to the world Daniel!